High quality larvae food suitable for rhinoceros beetles. 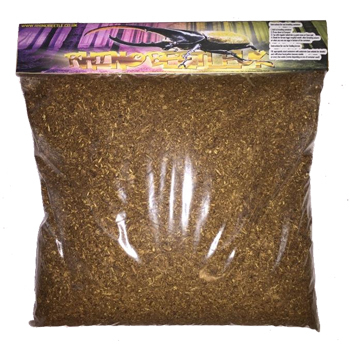 Product is 2.5 litre of enhanced Rhinoceros beetle "mat". This is enough substrate to feed a single L3 or a few L1/L2 larvae for around a couple of months. Standard food and bedding material for rhinoceros beetle larvae. This is a special mixture of flake soil, decomposed oak and other hardwoods which contains essential fungus species which have decomposed the lignin in the wood to make it edible to the larvae, the substrate has then been fermented to add aditional nutrients which is essential for acheving good results with some of the larger species such as Dynastes hercules hercules . You will also see this called "substrate" and "mat". Note: We also sell "POWER UP white rot oak substrate" which is one of the components of this substrate and can be bought as a supplement and would be advised esepcially for buyers of Chalcosoma,Xylotrupes or any species of Lucanidae (stag beetle), a layer of this substrate is also added in breeding tanks to encourage females to lay eggs.